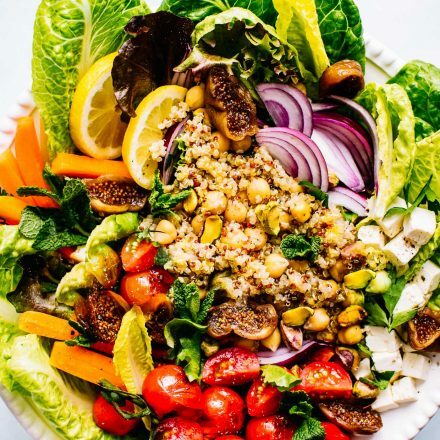 Healthy Moroccan Salad recipe with Chickpea and Quinoa . Plant based and rich in protein. Great for meal prep too! First, prepare your quinoa according to package. Fluff with fork and set aside. Rinse your chickpeas (if using canned) and then toss them with pinch of turmeric, ginger, and pepper. Mix together with cooked quinoa. Next, layer your salad. Greens, grains, vegetables, figs, feta, chickpeas, onion, pistachio and so on. Whisk together honey, 1/3 cup olive oil, 2 tbsp of balsamic vinegar, and remaining dressing spices. Pour over salad and toss. Mix in your chopped parsley. Add a splash of lemon and lemon slices to garnish. Serve immediately or cover and place in fridge for up to 2 days. For longer storage or meal prep, keep the dressing separate until ready to serve. Optional protein to toss in or layer on top of salad – grilled chicken, prosciutto, salmon, seared lamb, etc.